food, and pet rescue, among other things. Our President will deliver the State of the Union address on Wednesday, January 27. A lesson I learned well in 2009, when I could have lost both my parents--my dad to pancreatic cancer and my mom to a stroke. But the Lord spared them, and more than ever, I want to make the time count with the ones I love. We all have 24-7 and, despite how we often view the time, we do have choices as how to spend it. 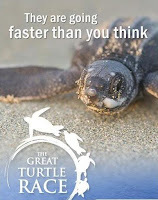 I refer you to the wise Jim Croce, who wrote in his song, "Time in a Bottle,"
What other important things am I putting off in the tyranny of the urgent? Time with the Lord in the Word and prayer? Time pursuing the dreams and gifts He's given me? Time to look around me and enjoy the beauty of His world? Time to write a note, prepare a meal, drop by to visit someone who needs it? Time to read a good book or listen to a friend? http://ads.addesktop.com/ads/ad12946bc-map.cgi/SZ=336X280B/KW=WDGWRITE_BETTER,WDG7_TIPS_TO_LAND_THE_PERFECT_TITLE_FOR_YOUR_NOVEL,NOFORUM/BCPG137310.193883.249656/" target="_blank" style="font-weight: bold; color: #16616c; display: block; text-decoration: none;">Effective Novel Hooks - December 10Get your hook evaluated by an expert! Simple but profound helps to choose the best title for your work. Here I go, posting by Posterous. When it works right, technology is a beautiful thing. I'm getting giddy, just learning how to use this! I know. Not so great with the bedtime resolve tonight. But Mark Twain said, "Why not go out on a limb? That's where the fruit is." So, knowing hubby would be back in town tomorrow--today, considering the time--I reworked my resume, wrote a cover email, and applied for a writing opp. You never know. In the meantime, I haven't let my desk go to seed again. Aren't you proud of me? I also purged the remaining files in the wall slots and started on the ones in the basket at my feet. (See photos.) Don't look for perfection; that's not my aim. I found a sneaky way to purge and have devotional time simultaneously--reading through old conference notes. No idea why I saved all those. For years. Most of those folks are published (perhaps even in Heaven), so it's not like I'm going to write a book based on the material. But the Lord is reminding me of things I thought I learned well long ago. REALLY got some unplanned cleaning done when I lost a picture card loaded with otherwise unsaved photos. After prayer and many hours, it turned up. Thank You, Lord! Now it has a home, and I'll try to add a few to my computer each day/week. 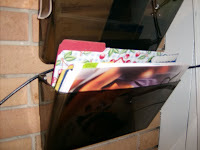 In a flash of genius, last night I sat on the sofa and watched "Chuck" with hubby while I sorted out the file folders that hang in wall sorters above my desk. Why not be comfy and sociable while I'm decluttering? Did I really need the last two plan booklets on our son's health insurance, when we'd gone to a higher deductible to save on premiums? Why was I saving my daughter's airline ticket from her study abroad program? Not OUR memorabilia. When would our son again use a CD of the 2006-2007 Student Handbook for his college? 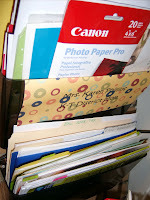 Before decluttering and sorting files, I removed all the paper for printing and separated it into recycled and clean, adding to baskets I'd started on the bottom shelf of my kitchen island. At the end of the evening--even catching enough of "24" to grasp the plot--I had three empty folders and a readily accessible filing area. Today or tomorrow I'll hit the top section of the wall sorter. Far from decluttered, but I'm getting there. Figured you wouldn't want such proof as an inside shot of the kitchen garbage can. I now have a basket--and space for it--to keep my small notebooks, flash drives, grocery receipt for survey, etc. Anyone been working on your own declutter project and have progress, however small, to share? Day 2 Desk Declutter--Can You Spot Bare Surfaces? I zoomed in, because I wanted to focus on what's missing, rather than the clutter still present. Amazing. My mind already feels clearer. I feel relief, that I've dealt with all the matters piled on either side of my computer. If this keeps up, I may find the freedom to do some real writing! How is everyone else's desk or other small flaming hot-spot coming? 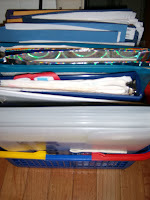 For serious--but fun--declutter therapy, go to Flylady.net . It's already improved from yesterday. Though you can't tell by looking if you didn't see it when. Okay. So it's pretty bad--so bad I didn't even notice until I REALLY looked at it this morning. This may be more of a one-week project than a one-dayer. Progress. Miniscule, But Nonetheless, Progress. As I review my written and unwritten resolutions, I see the healthy lifestyle goals didn't get a lot of attention over the weekend. This is when it would be easy to say, "Aw, phooey. Why bother trying at all?" This is the time to say, "Get back up there and ride this bronco." What can I do do make it easier on myself to eat healthier, eat less, and exercise more? As for writing, I need more specific targets, perhaps different areas I work on different days of the week. This requires a thought-out plan, but quickly, before I quagmire. Spiritually, I need to concentrate on praying more specifically for family members and friends. I need to focus on my reading and studying and pray over it, in order to let it soak in and then apply what I learn. As for decluttering, there's enough there to work on for hours a day, but that's too overwhelming. 10-15 minutes at a time is plenty. 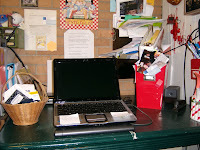 Hot spots such as my desk and the kitchen island are improving but still need work. Progress. No matter how atomically small. That's what resolutions and goals are about. Not a day for concentrating on resolutions. We left town early for my hubby's business meetings. Then I spent a good part of the afternoon and evening on the writers guild newsletter--if you don't count the time I broke for lunch, answered texts from our kids, and visited with hubby during his break. I consider it God's sense of humor in teaching me patience and persistence in that each week, I face some new issue or challenge and have to learn a new skill or technique to deal with the newsletter. It's teaching me so much, not only about writing, editing, using Constant Contact, and working with people and their submitted material. But I was writing. I was taking care of priorities. So a productive day, with no regrets. 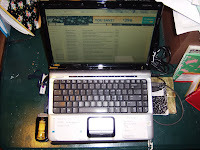 I intended all along to submit the chapbook manuscript for the Poetic Asides blog November Poem-A-Day Poetry Challenge. However, the previous year, I let the joyous busyness of December prevent me from selecting and revising the poems to send. Still, I couldn't find/make the time in 2009 during what turned out to be our "funnest" Christmas season ever. Last weekend found us packing away the tree and wrapping paraphernalia. That left me with Monday and Tuesday. So I began, determined to hone 30 poems into a chapbook manuscript. Maybe it's not perfect. Maybe it's drivel. But I did it. For the VERY FIRST TIME EV-ER. This is what resolutions are about. The old saw, "If you aim at nothing, you will surely hit it." Who knew, forty years ago, I would ever have the nerve to even try such a feat? I learned late in life, but at least I learned, that even simplistic tiny goals are better than none. So did I write today? You bet. Revising is part of the process. And blogging counts, too. Did I spend time with the Lord today? Yes, about what my goal was. Did I eat perfectly? Nope. But I did cook a healthy dinner and kept my portions down. And I discovered the Stage and Screen Channel on the kitchen TV. The cats are absolutely bumfuzzled when I dance around the island waving their feathery toy like Auntie Mame's stole or Ariel's treasures. Hey, it counts as exercise. I haven't completely put off the things I should do! Some success = success. 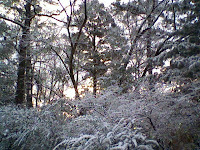 It didn't snow today, but it's not getting past twenty-something, so a frosty pic seemed appropro. For the South, this is hibernating weather. What does that have to do with resolutions and keeping them? It would be easy to vegetate near our new radiant heater and play on the computer. I could polish off the Christmas cookies or make a big dent in the dark chocolate I received as gifts. And I admit, I didn't blog yesterday, we ate unhealthy holiday food for dinner, and I slept in this morning. However, making changes in my life is not about punishing myself when I don't strictly stick to my goals. It's about baby steps. Making one little change at a time. One thing I like about today is going through some memorabilia my hubby found during our Saturday purge. I started a box (leftover from gifts) for each of the kids and told our son he might try sifting through and picking out one to three items he treasures most. Then when we come to another container of oldies but goodies, he can do the same with that. I read somewhere long ago to keep only one receptacle for memories. Then sort it each year, saving only a few items and discarding the rest. You keep the most meaningful objects and don't take up valuable real estate in your home. And it's easy to find and get out from time to time and remember what's important to you. Samples of what we found: a letter, full of funny misspellings. our daughter wrote in second grade to our son; our son's drawings based on the movie, The Mask; tickets to Knott's Berry Farm and postcards of Hollywood. This reminds me we need to get a scanner so we can lose the numerous boxes of photos that I will never get into scrapbooks. If I put these on CDs or DVDs, think what space we'll gain. I can do it one picture, one box at a time. Do you have a place to store a few special memories? Organized and at least partially cleaned out the cabinet in the garage hallway and the passage itself, so we can get to the contents easily, some for Christmas wrapping, some for the fans we use to keep the house cooler in summer, others framed photos from my late mother-in-law and from hubby's former office (current one wouldn't accommodate many). Cleared a better pathway to get the rest of the wrap paraphernalia to the main part of the garage. The best part of starting this at year's beginning? We're inspired to do even more. 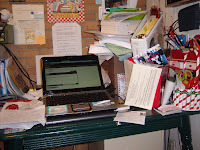 What have you decluttered so far in 2010? Don't you love a clean piece of paper or reading the first page of a compelling book? I breathe the fresh air today of the first day of 2010, just as clean, every bit as original and inspiring. I reread my list of resolutions, knowing as I pull the last of the sugar cookies from the last batch of dough out of the oven, the healthy eating won't begin until the weekend ends and we have eaten or tossed the last of the holiday food. But my mind mulls the possibilities of Monday morning, when all the bad stuff hopefully cruises down the street in the garbage truck, and I pull an apple from the refrigerator bin and climb on the elliptical trainer first thing. New routines. Instead of jumping into email and Facebook, I exercise and pray and read Scripture. No email till I've done those things, plus a healthy breakfast and my beginning 10 minutes of writing. See, I'm picturing the changes that will begin and snowball and make me better, happier, healthier, and more productive. Changes that will affect not only my life, but the lives of others. Ready to turn to the first page with me? I've already done my 10 minutes of writing!